*Example of how cancellation policy works. If guest is arriving on a Sunday and staying for 6 days they must cancel their reservation 3 days in advance to pay no penalty so in this situation no later than the Thursday before . If they cancel the reservation on Friday they will have to pay for Sunday but the remaining days will be refunded. If they cancel on Saturday then they will have to pay for Sunday and Monday but the remainings days will be refunded and if they cancel on Sunday they will have to pay for Sunday, Monday and Tuesday and the remaining 3 days will be refunded. If they are staying for 6 days and arrive on Sunday then decide they don't want to stay the remainder of the time then they will have to pay for Sunday, Monday and Tuesday but the remaining 3 days will be refunded. If case of a No-Show there will be no refund! I'm willing to work with guests with extenuating circumstances. Check-in is between 4 PM and 9 PM. Check-out is 11:00 AM. However, if guests wish to stay longer than 11 AM it is fine as long as their belongings are out of the rooms so we can clean them. No smoking, drugs or drinking alcoholic beverages allowed on property. Violators will be asked to leave without a refund! Room rates are for 2 people. Any extra adults are $7 per night. Children are welcome in private rooms. Children 2 and under are free. Children over 2 are an extra $5 per night per child. BOOKING INSTRUCTIONS: Enter the CHECK-IN and CHECK-OUT dates and click SEARCH. For a Private Room enter the number of ADULTS and CHILDREN then be sure and select '1' under ROOMS. Repeat if booking additional rooms then click BOOK NOW. For a bed in a Shared Dorm room select the number of beds you want then click BOOK NOW. If you experience any problems please call 208-270-1039 for assistance. 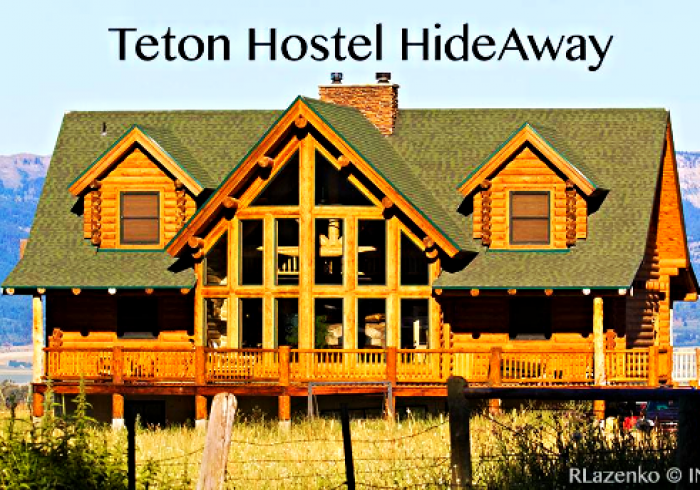 Teton Hostel HideAway B&B is located in the heart of the Tetons just east of Driggs, Idaho on the border of Wyoming in beautiful Teton Valley. Our beautiful lodge style log home is situated on 13 1/2 acres mostly hidden from all other homes and surrounded by farmland. The home has many covered porches and a patio. We have a 6 bed mixed dorm room and a 6 bed female only dorm room (beginning late April 2017) with shared baths and two private rooms for 5 to 6 guests. Guests in all room types can prepare their own breakfast with foods we provide such as coffee, bread, eggs, milk, hot and cold cereals, fruit, yogurt, bagels & cream cheese, etc. We also provide a kitchen where guests can prepare other meals. A fridge is provided for their use. Free wi-fi throughout the house. 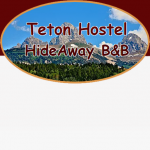 It is only 10 miles to Grand Targhee Ski Resort, 35 miles to Jackson Hole, WY, 60 miles to Teton National Park and 100 miles to Yellowstone National Park.